What is interesting about Peter is that he is always all or nothing. From what we can see about him from the gospels and in Acts it seems to be he was the kind of person that just blatantly said whatever he thought and did whatever he thought without thinking first. A few examples and when he, James and John were on the mountain when Jesus was being transfigured (the bible literally says he didn’t know what he was saying when he suggested building three altars), when he cut off the servant’s ear in the garden of Gethsemane, when he strongly stated he would never deny Jesus. There are many others. But the point is that Peter seems to have had a strong personality. Because of this he would have been a very hard man to convince, but one he was won over to an idea I can imagine he was very set on that belief. This is why it would have taken a special revelation for the Lord to change his mind about Gentiles and why, once returning to Jerusalem, he would have been the strongest candidate to stand firm in teaching this truth to others. I like the parallel that is drawn between Peter and Paul in what could be described as similar conversions, but like Paul’s conversion, I wouldn’t quite go so far as to say that it was a complete change of life. We discussed in class how Paul’s “conversion” may better be deemed a calling because he remained a Jew, but chose to accept Christ as His personal Savior. Who and how he ministered changed, but his practicing of Judaism, personally, did not. Likewise, Peter’s case is quite similar. He had believed in Jesus long before this, having seen Christ through his ministry, death, resurrection, and ascension, yet even Peter was still Jewish at heart, keeping the food laws and the Law to some extent. This command from God to eat all food, clean or unclean, and to minister to Cornelius, a God-fearing Gentile, would better be described as a calling rather than a conversion. Conversion has a sense of changing from religion to another religion. Peter, and for that fact Paul, were both not changing religions, but rather growing in their knowledge of God through His Son, the Messiah. It is for this reason that Peter still remains hesitant concerning this calling–he is not used to being able to eat with Gentiles and to eat the food that they consume. It was a foreign way of life, so I can understand Peter’s hesitancy and slight aversion to what God has called him to do. Honestly, this hesitancy was Peter’s way of testing the situation to be assured that this was the way God had commanded. One of the major reasons for the Jews in Jerusalem is because of the social ranking in that society at the time was like the social ranking of today of the “in crowd” and the “out crowd”. Though, I think it seems to go deeper than mere social ranking in the first century. Peter grew up with the belief and the history that socializing with Gentile would cause lots of trouble or lead the Jewish heart away from God. Since Peter’s experience with Cornelius I think was in a way a conversion because a conversion is when the heart and mind are changed for the better. It was like with Paul’s experience where he had a change of heart as well. So, in a matter of speaking I think that he did have a conversion and even though it was difficult for Peter to go through. As him being one of the role models for Jerusalem believers I think that it helped the body of Christ during that time to grow. Peter’s views about the Gentiles are changing instead of seeing them as part of the “out crowd” I think starting to change in seeing them with the “in crowd” and becoming part of the body of Christ. I would have to agree with Mary. Peter was already converted and walked with Jesus, so this was not a conversion. This was, however, a changing of ways for growing up, Peter learned that to not eat or be among the gentiles, and this did not change for him until Acts 10 (even though he knew that Jesus ate among the gentiles). In my opinion, for Paul is was more of a conversion because he went from persecuting the Christians to following Christ, more of an abrupt change. Peter’s experience, as Mary stated, was a calling to preach to Cornelius and start the ministry to the gentiles, and God had to tell him three times to do it for it was something that was against how he had been raised as a Jew. Much like James Dunn I would describe Peter’s experience as a conversion. Peter struggled with Gentiles and asked God how he should handle it. He wasn’t sure if God accepted them as his people. When God showed him the vision, I believe this is where his conversion happened. After the vision Peter said “Truly I understand that God shows no partiality, but in every nation anyone who fears him and does what is right is acceptable to him” Acts 10:34-35. At the beginning Peter did not understand how he should live with Gentiles. After God showed him the vision, Peter was a changed man he now understood how to treat and live with the Gentiles. I wouldn’t call it a conversion at all. The parallel is great, but given the fact that Peter had a vision of Jesus and Paul had the vision of Jesus are two completely different things. Peter only was called to preach to Cornelius. Paul was called to preach to more than just a centurion. Also, Peter’s view’s start to change for the way I believe as to how Jesus taught the disciples. In Matthew 7:1-5, Jesus teaches not to judge. Jesus was a mere friend to those who were unclean and sinful beings, even though they had the faith in who Jesus was. As with Peter, “God has shown Peter that I should not call anyone impure or unclean” (Acts 10:28). Now the question is now this: Is Peter really going back to the roots of discipleship after his vision, remembering Christ’s words of being judged by another man? As God-fearing Cornelius was, Peter maybe makes a quick-judgement because of his ranking as a centurion, only realizing that Cornelius wants to learn the ways of Christ. Comparing Peter & Paul seems like the logical, American Christian thing to do – and I can completely see how applicable this view can be! Peter receives a vision, specifically calling him to preach to someone, just as Paul was called to follow Christ on the Damascus Road. Now, there is also the angle that these two events are entirely un-relatable – due to the difference in drastic changes in their lives. However, I think Luke points out the similarities entirely too clearly for us to ignore them, and pointing out how God used these two men to be some of the greatest in reaching the Jews, the Gentiles, and as much of the known world as possible! I think that God used these two visions to specifically point to the changes that had to take place. Peter and Paul were both devout Jews, practicing Judaism after salvation. It’s almost as if God sends a little nudge through the vision to Paul, starting a cycle of getting away from simply keeping faith to yourself. Paul then ministered to many, many people, even with danger. Then, by the time the early church reaches Peter’s vision, it is as if God is pushing Peter first, as a nudge to the entire church that He has given faith to more than those who can follow religious traditions. Quite simply, it appears to me that He is almost chiding Peter at this vision, something like “You were with Jesus. Follow His example already! Reach out of your comfort zone of culture and religion, to a world that I created around you!” Though I can relate to Peter’s response, thinking that God might have been testing him – he was a strong Jew, this step probably took more obedience than did the choice to leave behind fishing to become a fisher of men. I would describe Peter’s experience as a calling rather than a conversion because Peter did not switch to another religion; he just grew in his knowledge and understanding of his faith through Jesus Christ. I believe that God gave Peter a vision to prepare his heart for what was to come. It was unheard of for Jews to eat with Gentiles because of the differences in the foods that they consumed. I can understand why Peter would have been a little skeptical about visiting Cornelius. In spite of the crazy thoughts he must have had, he was obedient to God and followed the calling God gave him. I can say that Peter’s heart began to change toward Gentiles after the vision and especially after meeting with Cornelius in his home. Both Peter and Paul were obedient to the Lord when He gave them a calling and because of their obedience, many people were able to come to know the Lord. I disagree with the idea that what Peter went through was “a conversion” as Paul did. A conversion usually refers to someone converting from one thing to another, but I don’t necessarily believe this is what happened with Peter. There are some major similarities between the two experiences had by Paul and Peter, but I think Peter was just called, not converted. Peter didn’t change to a new religion, he was just obedient to the God he already served, doing something very out of his comfort zone. The only thing about Peter that changed in this instance was his view on Gentiles coming to the Lord, not his view on God, which I would have considered a conversion, like Paul’s. I myself saw this situation much like Mary did. I do not really see this as a conversion but I see it as a calling. Also I see that this situation also shows the unequal between Jews and Gentiles. I think that Peter was called for a lot of different things. Mary stated in her post that, “Peter was called specifically to preach to Cornelius” (Pryer). I agree with that statement. I believe that if God has called someone to do something then they must do it. I think that God will call people to do things just to test their faith. In this situation I think that God was testing the faith of Peter. This would not be the first the God tested the faith of someone that he called. Another story that comes to mind when God tested the faith of someone he called was the story of Jonah. The difference was that Jonah tried to run and Peter just had to be told three times to kill and eat. At first Peter had his own thoughts or ways, and God had to show him that all people were equal in Christ. Galatians 3:28 says “There is neither Jew nor Greek, there is neither slave[a] nor free, there is no male and female, for you are all one in Christ Jesus.” I think that is the main thing to take away from this situation is that we are all equal in Christ. I would have to agree with many of the people that have posted that I do not view this as a “conversion” but more of a calling or change of heart. Peter knew how to live a Godly life and he did so, Paul was transformed completely into a Godly man after the Road of Damascus. Peter was told by God to go to Cornelius and Peter did. I like how Peter was changed about two things in this passage. The meat, and associating with Gentiles. When God appeared to Peter and told him to eat the meat, Peter said no because it was uncommon and unclean. Later when Peter is with Cornelius, he realizes what God was doing. In verse 28 Peter states that everyone knows it is wrong for a Jew to associate with any other nation but God had shown him that is it not his place to say what is unclean or common. I believe Acts 10 was a conversion for Peter but not the same conversion that Saul had as James Dunn had claimed. I think when many individuals hear the word conversion they automatically think of the conversion to God. The reason for this is because of Saul’s conversion and his three different accounts of it being told in the book of Acts (Acts 9, 22, and 26). However, if one takes away the mindset that the word conversion only means to convert to God he would realize the word conversion in itself means the process of changing or causing something to change. Therefore, I believe the change Peter experienced in Acts 10 was a conversion. This is because his experience in Acts 10 took him through a process of complete change. It all starts when Peter does not understand the vision given by God to be able to eat clean and unclean food (Acts 10:14-16). This passage shows that Peter, at the time, was willing to call certain animals and people unclean in the eyes of God. However, when he is when brought to Cornelius by the two men is when the conversion fully takes place because it is here that he realizes what the vision meant (10:28). He now sees that God welcomes everyone and Jews and Gentiles can eat and gather with one another. Believing this was a complete, drastic change for Peter because at the time “the Jewish traditions of purity made it virtually impossible for them to associate with Gentiles without coming ritually unclean (ESV, pg. 2103).” He is changed so much by this account that even when he is criticized for it he still stands in faith for what he now believes and tells others about it (Acts 11). Hence, at this point in Acts, Peter now has a new outlook on Gentiles. They are no longer unclean, unholy individuals Jews should not associate with. Now they are a part of God’s people. In the end, this was not a “conversion to God” such as Saul experienced rather it was a conversion to seeing the true love of God who accepted all people no matter how unclean or unholy. Something Peter never saw/experienced up until this point. I like the fact that Luke portrays Peters reluctance and hardship. Often people feel like feeling reluctant isn’t normal but Luke shows that many people were reluctant to change their ways, including Peter himself. Peter makes it clear that being all in is important but being all in can still be difficult. At this point, Peter is going against what some of the most influential people of his time were saying or expecting of people. It is Peters calling to have a meal with Gentiles and lead the pack to reach the ends of the earth, Jesus charge. I like that aspect that Luke portrays as well. I think that often times, we as Christians forget that the people who were closest to Jesus, his disciples, were also human and struggled with the same things that we do. I feel like we so often glorify the disciples and forget that they had hardships too. It is a nice reminder though that the people who saw and walked with Jesus struggle with the same things that we do nowadays. I think that this vision was also able to give Peter more confidence to do the thing that he was called to do. I like how you point out that the disciples the people that Jesus was close with were human just like us. Many times it is easy to forget that they were one of us because Jesus spent a lot of time with them. It is also a reminder that the disciples struggled with the same issues that we do just because they were in the presence of Jesus didn’t make them perfect. With that being said when Peter makes his decision he went against his gut because he knew he could trust Jesus. Some times when we don’t know where to go we have to just make a decision and trust God because he will guide us if we listen. In Acts 10 Peter is called to go to the home of a Gentile named Cornelius. 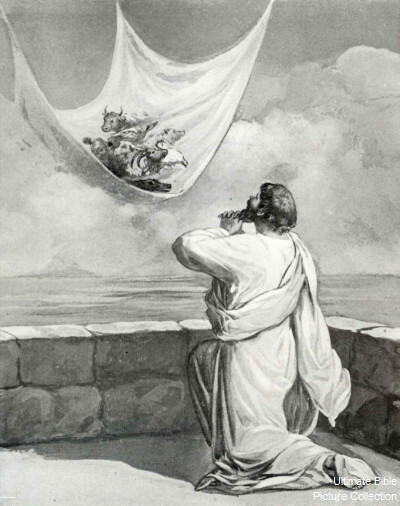 Previous to this calling he had a vision of clean and unclean animals descending on a sheet. Peter is told to “Get up. Kill and eat” (Acts 10:13). Peter is astounded because he cannot eat unclean things because he is a Jew. Then the voice from heaven tells him “Do not call anything impure that God has made clean” (10:15). If this verse is just skimmed over and we address it directly to the food he ate, then we miss the point. Shortly after his vision ends is when he is called to go to Cornelius’s home. He goes to his home and though he is hesitant when he arrives, he enters and dines with the Gentile people within the home (Long). The important part about all of this is not just simply that he ate with them, but it is about the message that He brings to them. He is criticized for dining with them, but in reality, he is living out his calling. It had been promised for a while that all nations would be saved through the coming of Jesus, “but this promise is not made good until Peter’s encounter with Cornelius in Acts 10, which initiates the mission to the Gentiles” (Jipp 11). Therefore, yes Peter was hesitant, and that is probably due to the fact that what he was about to do was revolutionary to the mission of Jesus. Peter was an agent of Jesus’ saving hope to the Gentiles. So yes, he did have to break some boundaries, and yes, he was deeply criticized for it, but it was the call that God directly placed on Peter’s life. It changed him and it changed the mission of the church. Acts 10:15 is the verse that is so profound in this change. The Gentiles may have been unclean people before, but God was reaching out to redeem them as well. He used Peter as a catalyst for this. I would not consider Peter’s experience as a conversion, rather than just a situation that he had to choose something. Peter made a decision on what he thought of the Gentiles based on what he heard from God. I think Peter’s unknowing actions can be rightfully explained. He is going against what he thought was right and in the end saw God through it, I would not consider that a conversion, because I think he didn’t change his mind about what he thought but more just learned more about something he already believed, then acted on his new knowledge. I think that Paul’s view of Gentiles has changed quite a bit. Peter talked about how it was considered unclean for a Jew to eat with a Gentile (Acts 10:28). However, he did not disobey God and went to Cornelius’ house and sat down with him and encouraged him in his faith. Also, I would not consider his experience to be a conversion because it is the same thing with Paul. He is changing his thinking and view point, but it is not like when we think of a conversion from Islam to Christianity. We need to look at this as more of a worldview change. Peter is learning that God’s plan is to have the gospel go to the Gentiles as well as the Jews, so it is important that they converse and worship together. They are coming together as one church and as one body of Christ. I think that it is important that we are able to look at this story of Peter with the idea that it is a conversion story. Peter was stuck in his ways and so it made it hard for him to be a witness to anyone but Jews. God knew this and so he came to Peter in a vision that allowed Peter to have a better understanding that God desires to know everyone. Joshua Jipp states that during this vision that Peter has, “God is the one who has rendered insignificant the social divisions between Jew and Gentile” (79). Peter is so afraid of the little things like the social rules that were a barrier between the Jews and the Gentiles and so God has to show him in a way that he would understand. I wonder though if the significance of God showing him the dream three times had anything to do with the fact that Peter denied Jesus three times and then Jesus telling him to feed his lambs after resurrecting (John 21:15-19). Is this a common theme for Peter? This is definitely an important story of Peter to look at as there is some similarities between Paul’s conversion in Acts 9 but I would not call this a conversion for Peter as Peter is not converting from something to something else. At the end of the day, this seems more as a calling for what was to come. When we put on our “dispensational lens” I believe all of this can make sense if we understand that the entire Old Testament had the mission of Jewish ministry and same with Jesus’ ministry in the Gospels and now we have gentiles being able to receive salvation and be apart of Christ’s kingdom. It would have never crossed Peter’s mind or any of the other disciples to have tried to convert gentiles in the early chapters of Acts as so much of what they did was very Jewish things. We even see this example in chapter ten when Peter is tasked to “Get up. Kill and eat” (Acts 10:13). Peter is surprised because he cannot eat unclean things because he is a Jew. But now in these later passages, we see the tables turning. I do not think that in this section that Peter’s belief on Gentiles completely changes. As a matter of fact, I would say that it only gets more conflicted and more complex. I see it as he has a certain compassion for Gentiles and that he does want to minister to them in some light, but at the same time wants to be loyal to his Jewish faith and practices to not go completely back on those practices and principles. I see this as a thematic foreshadowing into the struggle between Jew and Gentile and the significance of that struggle that Paul has to deal with in his ministry. It is showing the tension between the two different groups that even someone who is as open to listening to God as Peter is and how much more difficult that makes Paul’s work in his ministry. It was more of a thematic preview of what was to come in the rest of the book of Acts with a little bit of foreshadowing into the character of Peter as well. Peter has been influenced majorly by the Jewish traditions, and following the law. He has been raised with this knowledge of the law, and most likely has memorized much of it. We have to try to put ourselves into Peter’s experience. For example, I was raised in a Baptist church, and their view of drinking is to never touch the bottle. Ever since I was a kid there has been this perspective of alcohol. As a result, I become very closed off to anyone who associated with drinking. Let’s say one day the leader of my church explains that God has told him getting drunk is okay. This example is far from perfect, but the principle remains the same, I would still be super hesitant to accept what the leader of my church said. In a very similar way we see Peter show hesitation accepting the truth about the gentiles. When we see the him return to the Jewish believers, they question, and even harass him for eating with a gentile. What makes his encounter with this gentile is that him was a Roman soldier who had probably killed many people, and would have been one of the most “unclean” people you could interact with. When you understand the background of where Peter and these other Jew’s are coming from, this is a perfectly normal reaction to what Peter has done. Looking back on Israel’s history we read in Exodus 19:5-6 that Israel was to be a nation of priests. The priest are the ones to intercede on the people’s behalf. This is the same idea with the nation of Israel, they were to bring the world into worship of the one true God. However, they fail, and reject the messengers of God, and ultimately reject Jesus, the righteous one. Thus, we read in 2 Chronicles 36:15-16 that a sense of doom is upon those who reject the messiah. I believe the question that you brought up at the end is a great question for this story, but also a great story for ourselves today in our world. it was such a big deal in there time because it was never ok for them to associate with the unclean of the time. not just to hang around the people, but also the food was such a big deal, and when Peter says he ate with them they are crazy, but his dream is just the icing on the top of doing something wrong, and Peter knows it. but they as us today need to realize when God sent that blanket down full of food it was not just saying we can now eat any food we want, but rather/also a blanket that is saying Gods grace is now for everyone. that is the biggest thing that I learn from this passage is now that Jesus has come, we can now all love everyone. It is interesting to read about just how separated the Jews made themselves against the Gentiles, especially when considering just how close these two groups are geographically. This is somewhat a generalization, but it seems so engrained in the Jewish culture and traditions to keep separate from anything that is not Jewish. When I think of this distain between the Jews and the Gentiles I think of the most passionate of sports fans. Though they are different from each other, they could theoretically live together in peace, but, because of the culture, there is a stigma attached. A stigma where one has to explain themselves when they seemingly betray their own group by involving themselves in another group. To me, this seems like the attitude between the Jews and Gentiles at this time, but potentially on a larger scale. As for the question, is this a “conversion” for Peter, I wouldn’t put it that far, but it likely was a turning point for him. Obviously, he understood that God was including the Gentiles in the fold of Christianity. His reputation, despite his objection, was likely hindered a little bit due to his time with the tanner. I think he had less to lose now that these things were the case, so he was more willing to be involved with the Gentiles. Now that he was involved, why not go all the way? Peter’s experience with his vision telling him to visit Cornelius would be a stretch calling it a conversion. There may be some form of conversion, but not in the same way we see the word today. Peter is no changing his religion or Who he believes in, instead he’s receiving instruction to visit a Gentile that the Lord has deemed appropriate for Peter to visit. Saying this is a conversion is a tad overreaching because it’s more of a realization or eye-opening that God wants the have the Gentiles as well as the Jews. There are, however, interesting parallels to what happened with Paul on the road to Damascus. Both had a vision/appearance from God telling them something that needs to change. Paul’s experience was definitely more akin to a conversion that Peter’s. Paul (at the time Saul) openly opposed Christ and the early church in Jerusalem. When Jesus appeared to him, and Ananias laid hands on him (curing his blindness that happened with his encounter with Jesus), Paul was thoroughly changed. Peter, however, was still very similar, but just with a new understanding of God’s plan. He was also not exactly enthusiastic at the idea of eating with a Gentile, with an aversion to going to Cornelius and entering his home. So, I do believe that it’s not quite right to call Peter’s experience an actual conversion. I think that it is really important here to reiterate that Jesus did come and sit and eat with the sinners. Those were the people that He interacted with. He came to heal the sick and save the lost. The Pharisees and that keepers of the Law thought that they already had it all together and were not looking for their Savior who was right in front of them, instead those who felt as if they were unworthy, or even unclean were able to come and interact with Jesus when He walked on this earth. Now, because the Jews refused to accept responsibility for what they had done, and refused the Holy Spirit in their hearts, they lost their rightful place in God’s plan to bring redemption to the world. But, that has never stopped God before. SO, now there was an opportunity for all to come to know Christ because one would no longer have to go through the Jews to get to God. This is when Paul is sent to start a ministry to the Gentiles. Even though he is a Jew and wants to hold close to the standards of the Law, God is able to show him that things are changing for the better so that all my come to know Him. The vision that Paul has is a representation from God to show him that what was once not even something that would be considered is okay now, Gentiles can now come before the Lord and believe in Him. I think that when it comes to a conversion it involves a change of heart. Peter had a one track mind that the point of what Jesus did was for the Jews and that it was his mission to get the good news to them. in his vision, Peter gets a glimpse of a bigger picture that God wanted him to see what the other half of the mission was going to be. Peter was stuck in the old laws and if those weren’t being followed when he was not living the life God wanted him to be living. The vision changed his heart towards the Gentiles because he knew they would be a huge part of furthering the kingdom. Peter’s experience is just as much of a conversion as Paul’s, which was a conversion of the heart. Peter, knowing the food rules, who you dine with, who you don’t, would know that eating with Cornelius was wrong. Just as Peter knew that the animals on the sheet in his vision were unclean. The Lord however instructed Peter to kill and eat. God had to break Peter of the old ways. The law had been fulfilled, things were not the same anymore. As humans change is often hard. Especially change as big as what Jesus brought. Peter’s heart went under a conversion in his vision. I think when Peter arrived at Cornelius’ house he was still struggling with this change (10:28). I think he is uncomfortable with this change, but considering who told him to change Peter is doing the best he can. I agree with many others here that chapter 10 is mainly about Peter’s conversion (and not Cornelius’s conversion). Sure, Cornelius is saved, and the Holy Spirit comes upon him (which is incredible and worth celebrating), but the true meaning behind the story is that all people are loved by God (Jipp 67 and Acts 10:34). Much like Jonah in the Old Testament, God is showing his disciple/follower that there is more to God’s love and compassion than mere human love and compassion (Jonah 1-4 in its entirety). God did not send Jesus to this earth to save only the Jewish people, but to provide a way of salvation for all who might believe (Romans 1:16). The true conversion of Peter in this story happens when he returns to Jerusalem and defends the conversion of the Gentiles and convinces the Jerusalem believers that the Gentiles too can be saved (Acts 11:18). The conversion of Cornelius and his acceptance as a believer of Christ was a crucial step for the early Church. For one, it opened up the disciple’s minds to what Jesus meant when he delivered the great commission and told the disciples to be his witnesses “to the ends of the earth”. The understanding of this phrase was certainly going to be more understood as the Church continued to grow. Secondly, it opened up the door for Paul to be able to begin his mission to the Gentiles with the support that might not have existed had Cornelius not come to faith. As Dr. Long describes, Cornelius is the closest a God-Fearing Gentile can get to being a Jew. He’s not circumcised but he gives alms and follows the Law. The Gentiles that Paul will soon preach to are pagans, hardly close to either Judaism or the Christian faith. However, Cornelius’ conversion is still debated by the early Church. While Peter may have had visions that prompted him to eat and share the gospel with the Gentiles there, the Jewish believers did not have that luxury. Either way, the early Church is almost required to view the conversion of Cornelius as true since the Holy Spirit came upon him; something the early Church members had never seen in a Gentile. This is the ultimate confirmation for Peter in many ways; reminding him that it is God’s will and plan that Gentiles would come to hear the Word and receive salvation through its teaching. I feel as though when it comes to conversion we need to come back to the core of what defines a conversion. A conversion is a change of the heart, but more than that in a practical sense it is the implication that someone changes to a form of religion, one that they were not apart of prior to. (Long) I do believe Peter’s vision is important, theologically as well as for narrative purposes in Acts, but I do not believe that it was a conversion experience for Peter. Peter was already filled with the Holy Spirit, which was stated many times in Acts, such as Acts 4:8, “Peter, filled with the Holy Spirit, said to them…” In this, Peter did not go from a place of no religion to a faith in Christ, becoming a Christian from this experience–or even a follower of Jewish tradition, was not a part in this passage from Peter’s development. That said, there definitely is the belief, and for good reason, that Peter grew spiritually from this event, but that again does not mean that the events of Peter’s vision in Acts 10 are that of a conversion story. Merely the continued pouring out of the truth that lies in the message: The gospel shall be given to the Jew but also to the Gentile so that the whole world may come to know and believe in the Way. That is the significance of this passage of Scripture, not whether or not Peter converted here to some form of new philosophy or religion.